I would like to walk around Airedale in the last of the pilgrimage to the dales. Skipton, a market town flourishing from the Middle Ages, is a gateway to Upper Airedale. Backed by the stream of Eller Beck and standing on the eminence at the head of town is Skipton Castle, which had been the home of the powerful Clifford family over 300 years. When I visited the castle, at first, I was surprised at being welcomed by the magnificent gatehouse having massive round towers on both sides. On the south and the north sides of the parapet of the gatehouse, large stone letters were carved. They were the motto of the family spelling "Desormais"(henceforth). When I passed through the gatehouse, massive round towers of the castle caught my eyes. Skipton Castle is said to be the one of the most complete and superb examples of a fully roofed medieval　castle in England. It was about 1090 when the first castle, a motte and bailey castle, was erected by Robert de Romilly, the Norman. So the castle has a history over 900 years old. The erection of the stone castle which we can see today was started from about 1311 by Robert Clifford, 1st Lord Clifford. The east portion of the castle, now a private residence, was built by Henry Clifford, 1st Earl of Cumberland in about 1535 for his son's wife Eleanor Brandon, the niece of Henry VIII. After the Dissolution of Monasteries, purchasing Bolton Abbey estate, the Earl owned the vast land in Airedale and Wharfedale. I found an interesting thing which I cannot forget at this castle. It was a bench with a hole in the small room next to the great hall (if my memory is correct). That was a garderobe; a privy. I imagened unnecessarily that the lords and ladies had sat here. Peeping through the hole of it, I could see the stream of Eller Beck flowing 200 feet under it. I felt my bottom chilled. Skipton Castle has suffered sieges twice in its history. First one was during the Pilgrimage of the Grace. But this time, the castle could easily shrug off the siege by the supporters of the rebellion. Second one was during the Civil War. At that time, Skipton Castle was one of the strongholds of the Royalists and was in siege by the Parliamentarian troops from 1643 to 1645 and surrendered consequently. The gatehouse was ruined in the siege and dismantled in 1649. 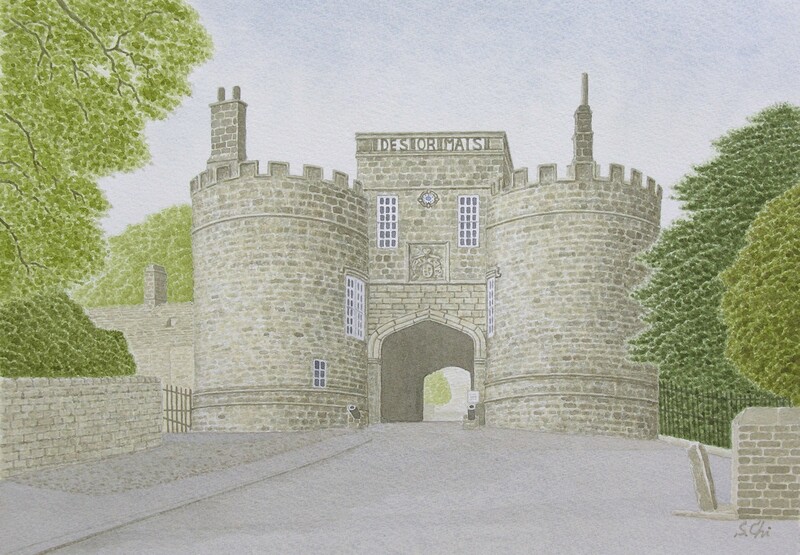 Lady Anne Clifford, the last Clifford to own Skipton Castle, rebuilt the gatehouse in about 1659. It is said that she planted a yew tree in the Conduit Courtyard to commemorate the repair of the castle. Lady Anne, appearing often in the history of Yorkshire as a powerful woman, made efforts to restore the castle and the parish church which was also damaged in the Civil War. When Lady Anne passed away in 1676, Skipton Castle also left the main stage of the history of England. The yew tree, estimated to be over 350 years old, is still looking after the castle. By the way, the Clifford family was Lancastrian during the Wars of Roses. Therefore Yorkists, including me as a fan of Richard III, have to pay attentions to them.